I was a young systems administrator working for an enterprise customer. I began to hear about this new-fangled VMware ESX thing. I started doing some research into ESX and loved the concept of it. We had access to a lab and I installed ESX 2 and began to play with it. Thankfully the company I worked for also saw the value of the product and we were able to move it from the lab to running some staging machines – this was ESX 2.5. From then on my primary job was designing, configuring and installing VMware environments. I was very lucky to be in the right place at the right time. I’ve always been the type to take on a challenge and there is no greater challenge in the virtualization industry. The more I learned about the certification, the process and the community the more I wanted to be one. 9 months from start of design to successful defence, that’s duration. I don’t really want to count how many hours I spent – probably 600+. Start early, give yourself a LOT of time and work with a group. The more time and discussion you have about your design prior to submission the better. That being said it’s a fantastic learning opportunity – I highly recommend attempting it. Give myself more time, not rush attempts. The interesting thing about the VCDX certification is the journey is the part that improves you most. My work had acknowledged this and noted my improvements as an architect prior to obtaining the cert. They also supported my pursuit of the designation without wavering. I have moved to a new role within the organization and all-around it has been extremely positive. Having employer support is a very good thing. 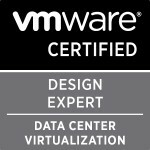 I’m still pretty fresh to being a VCDX; the response in the community has been fantastic. This has been the best experience of my career and I look forward to seeing where it takes me. Categories: Certifications, VCDX | Tags: Certifications, spotlight, VCDX, VCDX5 | Permalink.